Looping for Chie Arimura this week. Even par today. I’m impressed. Yesterday, my buddy Rick hooked me up with Chie (pronounced chee-A like Chick-fil-A) Arimura for the week. Don’t know why her regular couldn’t make it but time was running out and I consider myself fortunate. We were in the afternoon flight of the pro-am and she used this as her practice round. Didn’t seem to phase her that this is the biggest purse of the season and she couldn’t chip and putt from every conceivable position. It’s just another golf course. It was a great day with a equally great group. We had a little help on the par 5, 14th. A long drive champion Mike Dobbyn was on the tee and hit with every group. We had the option to use his tee ball and did. It was was a paltry 385 yards down the fairway but we took it anyway. 🙂 Chalk-up an eagle for the team. BTW, this guy was huge! Would fit in on any NFL roster. The morning flight had an LPGA Legend in each group along with the pro. Good to see so many familiar faces but one was right out of left field. 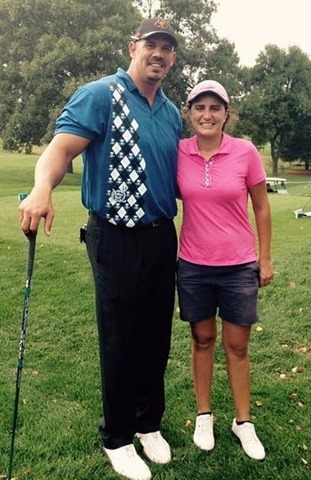 Jerilyn Britz (the 1979 US Open winner) participated and Bully and I touched base with her as she turned. The late Andy Pavich was on the bag for the win but my yardage book was in his pocket. Back then, there was no such thing as mass produced yardage books. Everyone made their own and as you can imagine, the numbers were subject to wide variation. I used a measuring wheel which was fairly consistent and let Andy copy my numbers. The rest is history. So I guess I had a piece of that victory. Jerilyn isn’t a staple on the Legends Tour but living just thirty miles down the road in Luverne MN, it was a natural fit to invite her to play. We met Marty on Monday during the compilation of the yardage books. 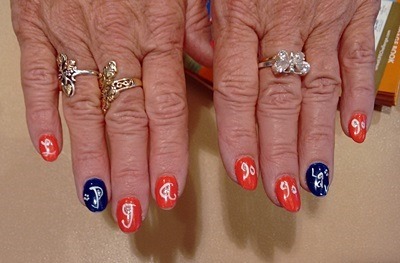 She is the self-proclaimed “MacGyver” of Willow Run and by the looks of her nails, a huge fan of the LPGA. This entry was posted on Thursday, September 3rd, 2015 at 8:03 pm and is filed under Uncategorized. You can follow any responses to this entry through the RSS 2.0 feed. You can leave a response, or trackback from your own site. One of the joys of my limited LPGA caddying was being able to carry for Jerilyn twice at the McDonald’s LPGA Classic at the DuPont Country Club. A joy to work with and for. Say hi for me if you get a chance in the next day or two.